After years of development, a company finally produced an EPA certified pellet stove that needs no electricity. The stove was developed by an Oregon company, Wiseway from which the stove takes its name, and then the company was bought by US Stove. The unit uses natural draft for the air and gravity to feed the pellets into the combustion chamber. For decades, one of the main drawbacks of pellet stoves has been that they don’t work in a blackout because they require electricity. And, with so many moving parts, pellet stoves often break down and need much more maintenance than wood stoves. The Wiseway stove won best in the Pellet Product category and the coveted overall Best-in-Show award at the 2014 HPBA trade show. Vesta Awards are given annually by Hearth & Home magazine at HPBA trade shows. Vesta Awards are not based on any testing or independent data but rather are identified by hearth experts as being innovative products during the week of the trade show. 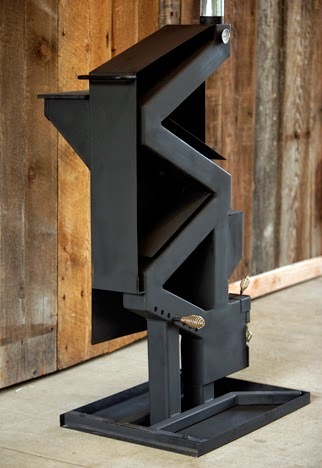 When the stove started to sell in 2013, quite a few customers had problems with it, including the pellets in the hopper catching on fire, also known as a “burn back.” The stove has been redesigned but it's still unclear if all the glitches are fixed. The launch of the Wiseway illustrates a much wider problem in the stove industry: a lack of reliable, independent product reports that assess consumer satisfaction and reliability. Even if consumers spend lots of time on the Internet reading various consumer reviews on sites like Hearth.com, it is still very difficult to get a sense of how common the problems are and what overall rating a product should have. Hearth.com has several threads on the Wiseway that are worth reading if you are considering purchasing one. Consumer Reports once did a very limited review of 6 pellet stoves, in which they recommended two. The review did not even mention emission rates, nor did it test for fan or augur noise, other common issues that consumers have with stoves. The Wiseway has no fan or augur noise, which is a big plus for some consumers. Moreover, the stove has a very respectable emission rate of 1.9 grams per hour. Equally important, it was EPA certified in 2014 during a time where pellet stoves were not required to get certified. EPA certified pellet stoves are likely to be more efficient since many, if not most, uncertified stoves pour excess air through the stove, which can significantly reduce efficiency. The Wiseway has an EPA verified efficiency of 69%, higher than some more expensive pellet stoves that use electricity. Many pellet stoves have efficiencies under 70% even though they advertise higher efficiencies. Generally, the Alliance for Green Heat advises consumers not to rely on manufacturer efficiency claims as they are often exaggerated, and instead to rely on the efficiencies on the EPA list. There is clearly a large market niche to be filled by a gravity fed pellet stove and Wiseway is the first one out of the gate. We suspect there will be competitors in coming years and that competition is likely to lead to even better products. Hello John read your article on Wiseway and was impressed with your unbiased report. I am a distributor for Wiseway stoves and have three retail locations of my own in So. Oregon. I have been in the hearth industry since 1976 and started as a sweep and installer then decided to get into retail a couple years later. I have acquired several certifications through the Hearth industry wood, gas, oil, pellet, chimney and draft or whole house venting. Helped write the certification criteria for the Oregon chimney sweep Association and worked closely with the Oregon State Fire Marshall to complete the process, was President Of OCSA for 4 years and President of Oregon Hearth and Barbeque Association for a term, sat on numerous clean air committees within our state and have been a member of HPBA for over 30 years. That's to let you have a little back ground on where I come from my name is Gene Bradley I am owner of Smokey's Stove's. I would like to give some feed back concerning the Wiseway and give folks a little more information regarding the product. I can be reached at 541-660-0021 if they are having any issues or would like any information.